Speedchecker is one of those programs that will allow you to check the speed of your internet connection. However, its usefulness is rather questionable because this program is classified as an advertising-supported application and it is unclear whether it presents computer users with reliable scan results. 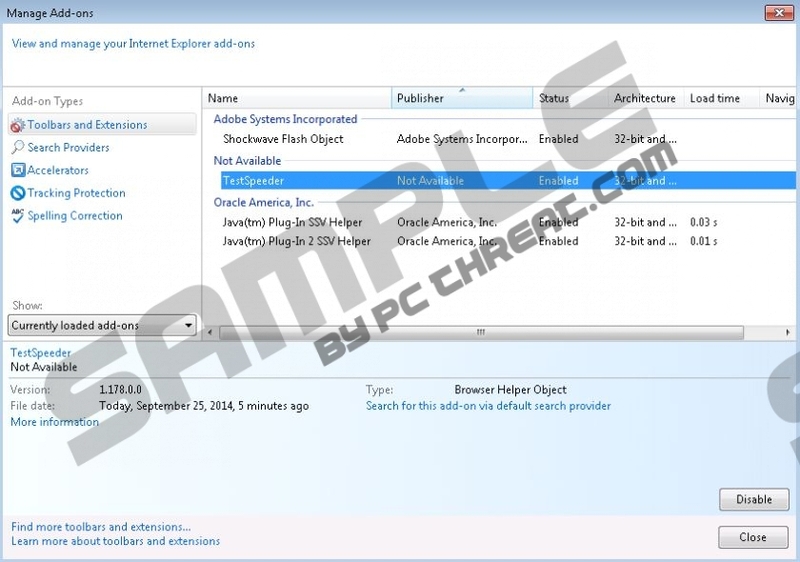 If you have started seeing ads after the installation of Speedchecker, it is very likely that this program is responsible for them. Unfortunately, the only way to prevent them from appearing is to delete Speedchecker from the system. In order to help you get rid of it, we have prepared the manual removal instructions. Scroll down and you will find them below the article. If you have noticed an icon in the Task bar and a small window with a title “SpeedCheck App” at the bottom of your screen, there are no doubts that Speedchecker has infiltrated your system. It does not matter if you cannot remember downloading it because this program can travel bundled with suspicious software and slither onto your computer without your consent. In this sense, the program is very similar to BestMarkit, Bettermarkit, and Re-markable applications. You should avoid them as well because they act very similarly. The most effective method to prevent unwanted programs from entering the system is to install a reliable security tool. The main drawback of Speedchecker is the fact that it shows various commercial advertisements. They do not seem harmful at first sight; however, you should know that they might still expose you to threats. Speedchecker is not responsible for the websites where you might end up after clicking on any of its ads. Thus, there is a possibility to visit unreliable places and come across malicious software. Furthermore, it seems that Speedchecker will record some details associated with your online behavior and transfer them to third-party advertisers. In order not to reveal this information to anyone, you should erase Speedchecker as soon as possible. The removal of this unwanted program will not be difficult at all because it can be easily eliminated via Control Panel. However, if these words do not say much to you or you just simply do not have experience in malware removal, you should delete threats automatically. Of course, you will have to acquire an automatic malware remover (e.g. SpyHunter) first. A reliable security tool will protect your computer from infections and you will not have to worry about your system’s security anymore. Find the unwanted application and click Uninstall. Select the suspicious program and then click the Uninstall button. Find the program that you want to remove. Select it. Quick & tested solution for Speedchecker removal.